LeapFrog The Tag Reading System Introducting Tag- the amazing touch reading system that brings reading to life like never before. 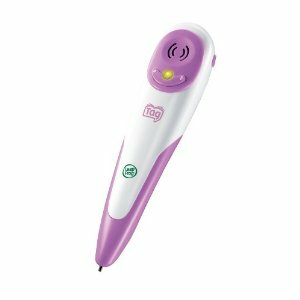 The Tag Reader is a touch-and-talk reading device that brings stories to life and offers insights into what your child is learning. 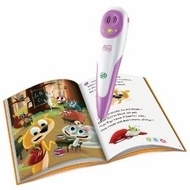 As your little one touches the Tag Reader to the pages of specially printed storybooks, a small camera in the tip "reads" the pages, allowing children to hear words and stories read aloud. Characters, pictures, and learning activities spring to life with every touch. Designed for kids four to eight, the Tag Reading System works with a broad library of more than 20 books and games. Children can explore classic books or join popular characters in new adventures. Leveled learning activities in every book adjust automatically to your child's pace, helping build confidence and a love for reading. The Tag Reader holds audio for up to five books at a time. Simply connect it to your computer with the included USB cable, download audio for your Tag books and drag-and-drop up to five of your children's favorite stories. While online, you can see your child's progress in recent books, get detailed updates on the skills they are exploring, and share in their accomplishments.